The Boston Museum of Fine Arts, like many museums today, have put images of many of their materials online. I just haven’t come to terms with how much is out there. If you go their collections page you can search for materials by keyword. 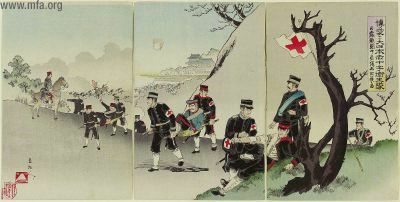 For example, searching for “Russo-Japanese war” returns all kinds of beautiful works, including many not currently on display in the museum. I especially appreciate their Image Rights page which emphasizes that if you cite the source, you are permitted to use the images for educational, personal, and non-commercial use, as per fair use. Compare that to the kinds of scare-language used by many other online photograph collections which don’t even mention or concede that such rights exist. Itagaki, Eto, Saigo) are discussing “SeiKanron” (征韓論）,for example. I am hoping to digitize them and show them at the library web site soon. Thanks for adding this! These digital collections are making it so much simpler to find things and make use of them. I look forward to seeing this on the Harvard-Yenching Library’s website. I know how busy you must be though. Incidently, I saw that you were given deep praise in the acknowledgments for your help in Paine’s book on the Sino-Japanese War. It looks like it isn’t just graduate students and scholars here who appreciate your wide knowledge and can benefit from your assistance when they visit H-Y to do research.